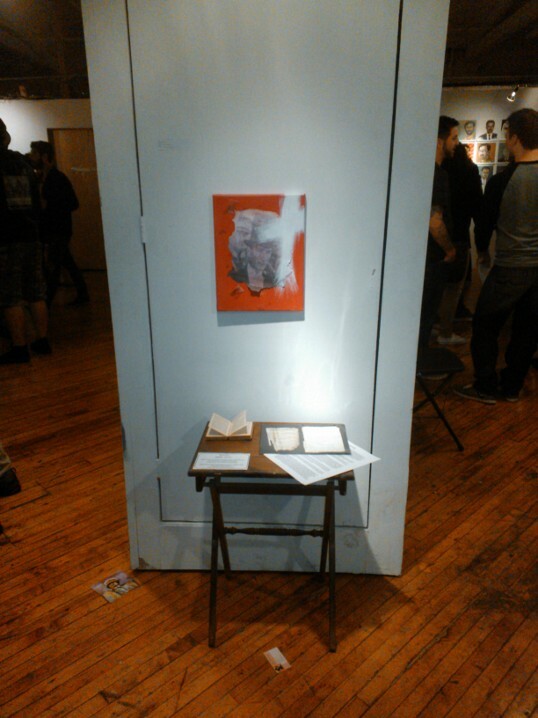 Winter 2013 - Art Shows in Philly, an appearance of the infamous Blender lamp at a concert by MegoDETH, and we donated a special edition hard drive mini Feedback Synth to The Hacktory's successful Kickstarter campaign. Bleep on kids! From Owner Ted Harms: DAED-modded Boss SD-1 & DAED-modded DS-1 : Modding by the freaks at Disagreeable Audio Experience Designs introduces mega-heavy fuzz, mini-theremin, high-pass filter, etc.through the swithces. The SD-1 has a power-choke for extra square-wave/bit-starved wonder. Also our recycled Art products are taking off including Clocks built into old harddrives, lamps built into game consoles etc. - A Bleeplabs original Thingamakit built into an 80s 2xl 8track playing robot. 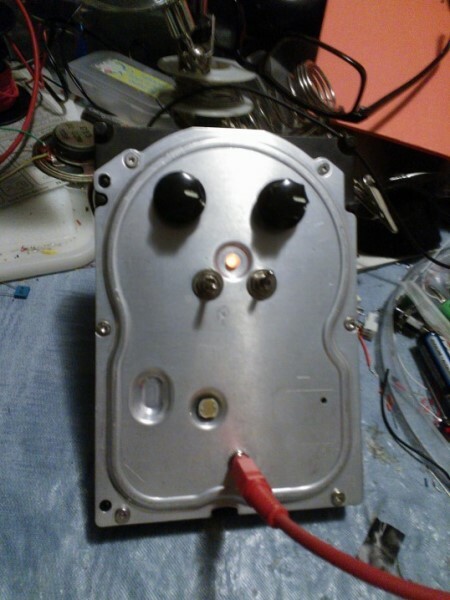 The original on/off volume knobs works and the eyes have the photoresistor sensors in them. A 9vt battery is accessible from the front tape port and it also runs off ac power. - 2nd pic is a prototype of the DAED ChaosVCO in frac format. This is a minimal dual VCO based on the infamous 40106 IC with manual pitch knob, broad cv in, and output on each channel. Each VCO operates independently and has a different range. It also can be placed in a portable case and run off a 9vt so it has an on/off switch when battery powered. Panel is a unique texture of hand treated aluminum. March - Many months have gone by and we have been busy in the lab with custom orders as well as occasionally venturing forth to play LIVE SHOWS. The biggest addition has been our new line of DAED Handmade jewelery, Clocks, and Lamps. Made from recycled electronic parts these bring forth the spirit of DAED in a fresh visual style. These Items will soon be available online and we also have them for sale and on display at Dylan Gallery at 1052 North Hancock St in the Piazza off 2nd St, Philadelphia Pa.
October - Our Coffin Wave handheld manual wave generator is a big hit for Halloween. Order yours today! September 2010 - Updated new Disturbo Logo now with orange lined knobs. Same over-the-top goodness. New DS1s in stock or send us your pedal! Summer 2010 - Orders for bent speak and spell/math/read units on the rise. We are slowly running out of stock of these old units but will continue to offer mods if you send us your speak. Full mods only $75! May 2010 - New updates and pages in our For Sale section. You can now browse our NEW DAEDHandmade pages for circuit bent and DIY instruments as well as visit our Studio Sale pages for vintage analog and other effects, synths, accessories , and recording gear. February 2010 - Lots of DIY action growing in the lab. Selling back stock of premade juicy wahs. January 2010 - This site goes live! We are continually making DAED products to order and keep a small stash on hand. Please EMAIL us to place an order to own your own DAED.